If you surprise the head ball coach on the first day of practice, you’re doing something right. And freshman quarterback Luke McCaffrey has done a lot of things right since arriving in Lincoln in January. The 6-foot-2, 185-pound McCaffrey pairs loads of promise with quite a bit of green. He wasn’t a regular starter at quarterback during his time at Valor Christian High School until his senior season (throwing for 2,202 yards and 21 touchdowns against just four interceptions; running for 526 yards and eight touchdowns), but quarterbacks coach Mario Verduzco doesn’t see that as an issue. Verduzco talks about the “domain stuff” often. He teaches his quarterbacks through the four domains of learning: affective, psychomotor, cognitive and physical. The simplest breakdown: affective is leadership, psychomotor is mechanical, cognitive is playbook, physical is, well, physical ability. McCaffrey has the physical part down about as well as a true freshman could. Maybe the knock on him before showing up in January was that he was slight of frame. He doesn’t fit the physical profile of Adrian Martinez and needs to add mass (borrowing from Verduzco’s vernacular), but that will be accomplished with more time spent around Duval. To offset, McCaffrey is already one of the fastest on the team. The cognitive part is what has endeared him to Husker personnel. Offensive coaches and players alike have all raved publicly and privately about the work ethic of McCaffrey. When he got on campus, he put his nose to the grindstone and went about learning the playbook as quickly as possible. With Nebraska moving even faster this year than last in practice, and having a bigger playbook to work with, McCaffrey hasn’t been swimming. The learning points right now, the spots where Verduzco still needs to work with the young cube, are mostly in the psychomotor stuff. “The thing that will maybe slow him down a little bit is once he’s getting ready to make the snap count, he might hesitate because he’s not quite sure where his eyeballs belong,” Verduzco says. “But that will get better.” So, too, will the throwing motion. McCaffrey had just 78 pass attempts entering his final year of high school football. As a sophomore, he had 717 receiving yards. There are some who want to slide McCaffrey out to a skill position for his first few years, partly because of Martinez’s presence at quarterback, but also in part because of the presumed rawness of McCaffrey’s quarterback ability. Verduzco says not so fast. The five phases: the stance, the initiation of motion (first step), the acceleration of the motion, release and control, and the follow-through. Verduzco likes to show Joe Montana highlights to his quarterbacks. Montana, Verduzco teaches, knew how to generate energy from his entire body into his throws. That’s an area he’s working with McCaffrey on. To put it simply: McCaffrey is exactly where he needs to be, both in terms of his development and his position. Nebraska would like to use this first season as a redshirt year (though the freshman is still competing in a “fast and furious” competition for the No. 2 spot behind Martinez) and it likes McCaffrey at quarterback. The more time he can spend with Verduzco now, the better off he’ll be later. 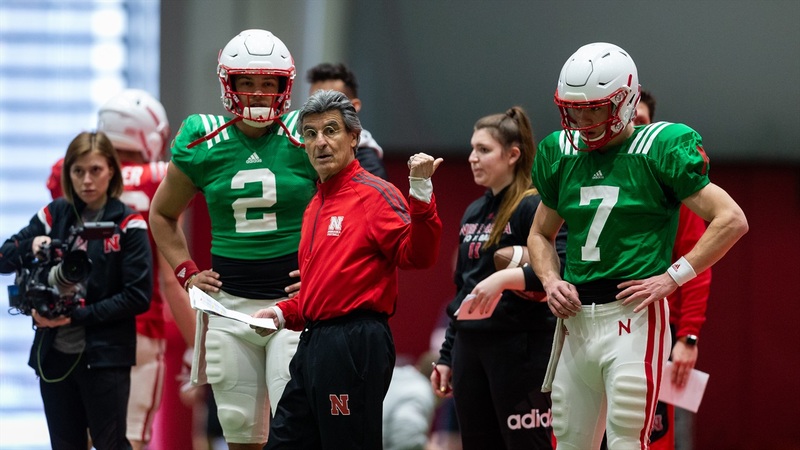 That doesn’t mean Nebraska can’t and won’t find unique ways to use him and Martinez together, but Frost calls Verduzco one of the best in the business for a reason. McCaffrey has that natural charisma you expect in a quarterback. He was a major peer recruiter for the 2019 class and connects easily to teammates. He went to Nebraska’s Pro Day workout inside Hawks and spent virtually the entire time side-by-side with Frost. “He fits in perfectly in the quarterback room,” Martinez says. Nebraska was in a precarious situation at quarterback last season. If Martinez went down for any extended period of time, Husker coaches were going to feel uneasy. Andrew Bunch and Matt Masker were walk-ons with zero in-game experience and Noah Vedral, the only guy who really understood everything the offense tried to do, was ineligible after transferring from UCF. So when Martinez went down during the first football game the Huskers played, Nebraska was in scramble mode. Bunch started the second game against Troy, a loss, and Martinez quickly returned against Michigan. From then on, any hit on Martinez was as nerve-wracking as possible. Nebraska feels much better about its quarterback depth this spring. Martinez is stronger and healthier, Vedral is “settled,” Bunch and Masker are improving. It’s a task right now dividing up all those reps in practice, but that’s never a bad problem to have. McCaffrey is in a good spot; he and the Huskers can focus on development.